ABSALOM ("The Father of Peace"). Third son of King David, born in Hebron in the early years of that king's reign. His mother, Maachah, was the daughter of Talmai, king of Geshur (II Sam. iii. 3; II Sam. xiii. 37; I Chron. iii. 2). Absalom appears as the avenger of his sister Tamar, who had been entrapped, outraged, and shamefully cast aside by her half-brother Amnon, David's eldest son. Having heard of the crime, the king was greatly irritated, but he had not the courage to punish Amnon, on account of his love for his first-born. The victim sought refuge in the house of Absalom, who advised her to bear the insult in silence. Absalom himself did not at first resent it otherwise than by systematically ignoring Amnon (II Sam. xiii. 1-22), but on the occasion of a banquet two years later, at which all David's sons were present, Absalom's servants, at the command of their master, fell upon Amnon and slew him (II Sam. xiii. 23-33). The other sons of David hurried back to Jerusalem, where a rumor had already spread that Absalom had killed all his brothers; and the king deeply mourned over the death of Amnon. As for Absalom, he fled to Talmai, his grandfather, in Geshur, and remained there three years (II Sam. xiii. 33-38). But soon David longed to see Absalom, and Joab, David's nephew, moved by sympathy for the murderer, availed himself of this opportunity to persuade the king to recall Absalom. David consented, and Joab went to Geshur and brought Absalom to Jerusalem, where he was restored to his house and family, but was granted no privileges of rank at court. Through the influence of Joab a reconciliation between father and son was brought about (II Sam. xiv. 1-24). At this time Absalom is represented as a handsome and full-grown man. His beauty, in combination with an amiable disposition, rendered him popular among the people, and he took advantage of this popularity to strengthen his own position and to arouse dissatisfaction with David (ibid. 25-35). Absalom asked his father's leave to go to Hebron, and he used the opportunity to encourage a rebellion against David (II Sam. xv. 1-9). Ahithophel, David's counselor, joined Absalom, while Joab remained faithful to David. 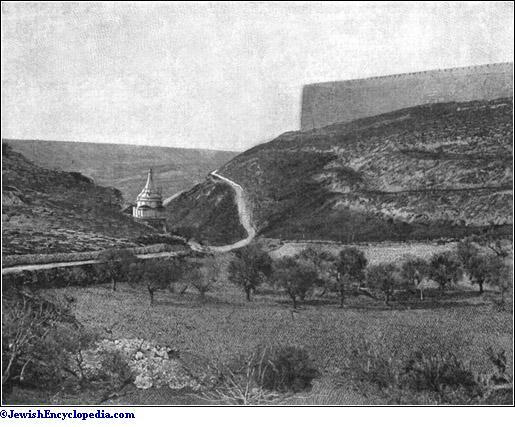 The rebellion assumed such large proportions as to oblige David to leave Jerusalem and seek refuge beyond the Jordan. Absalom entered Jerusalem, and, on the advice of Ahithophel, appropriated the harem of David as a symbol of having entered upon royal control (II Sam. xv. 10-xvi. 23). Absalom Caught in a Tree. 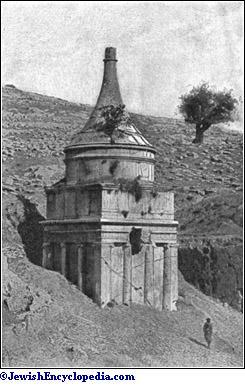 The Traditional Tomb of Absalom. Ahithophel proposed to pursue David with 12,000 picked soldiers and to bring back to Absalom all the people that had fled with David. This plan was frustrated by Hushai, who counseled that all Israel be gathered from Dan to Beer-sheba, unto Absalom, and that the latter should then go to battle in his own person (II Sam. xvii. 7-13). It is very likely that, during this interval, Absalom was anointed king (II Sam. xix. 11). But the delay gave David time to reach the Jordan unmolested and also to strengthen his army. While the king himself remained in Mahanaim he sent forth his warriors divided into three columns (II Sam. xviii. 1-4). The encounter took place in the forest of Ephraim. Absalom was defeated, and while he was fleeing through the forest his long hair was caught in the branches of a tree. One of Joab's men found him suspended from the tree and reported the factto Joab, who thrust three darts through the heart of the rebellious prince. The death of Absalom put an end to the rebellion. According to II Sam. xviii. 33, xix. 1-5, David's mourning was greater for Absalom than for Amnon. 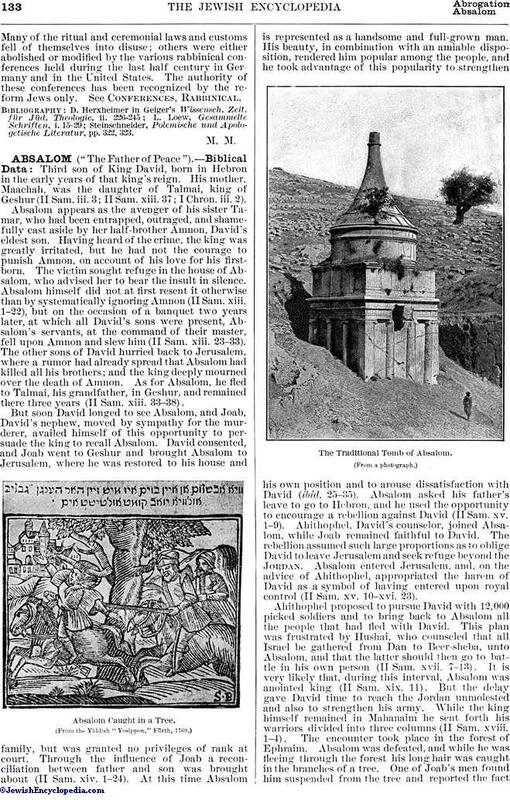 See Absalom's Tomb. 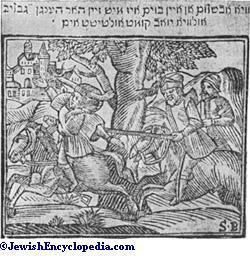 The life and death of Absalom offered to the rabbis a welcome theme wherewith to warn the people against false ambition, vainglory, and unfilial conduct. The vanity with which he displayed his beautiful hair, the rabbis say, became his snare and his stumbling-block. "By his long hair the Nazarite entangled the people to rebel against his father, and by it he himself became entangled, to fall a victim to his pursuers" (Mishnah Soṭah, i. 8). And again, elsewhere: "By his vile stratagem he deceived and stole three hearts, that of his father, of the elders, and finally of the whole nation of Israel, and for this reason three darts were thrust into his heart to end his treacherous life" (Tosef., Soṭah, iii. 17). More striking is the following: "Did one ever hear of an oak-tree having a heart? And yet in the oak-tree in whose branches Absalom was caught, we read that upon its heart he was held up still alive while the darts were thrust through him [Mek., Shirah, § 6]. This is to show that when a man becomes so heartless as to make war against his own father, nature itself takes on a heart to avenge the deed." Popular legend states that the eye of Absalom was of immense size, signifying his insatiable greed (Niddah, 24b). Indeed, "hell itself opened beneath him, and David, his father, cried seven times: 'My son! my son!' while bewailing his death, praying at the same time for his redemption from the seventh section of Gehenna, to which he was consigned" (Soṭah, 10b). According to R. Meir (Sanh. 103b), "he has no share in the life to come." And according to the description of Gehenna by Joshua ben Levi, who, like Dante, wandered through hell under the guidance of the angel Duma, Absalom still dwells there, having the rebellious heathen in charge; and when the angels with their fiery rods run also against Absalom to smite him like the rest, a heavenly voice says: "Spare Absalom, the son of David, My servant." 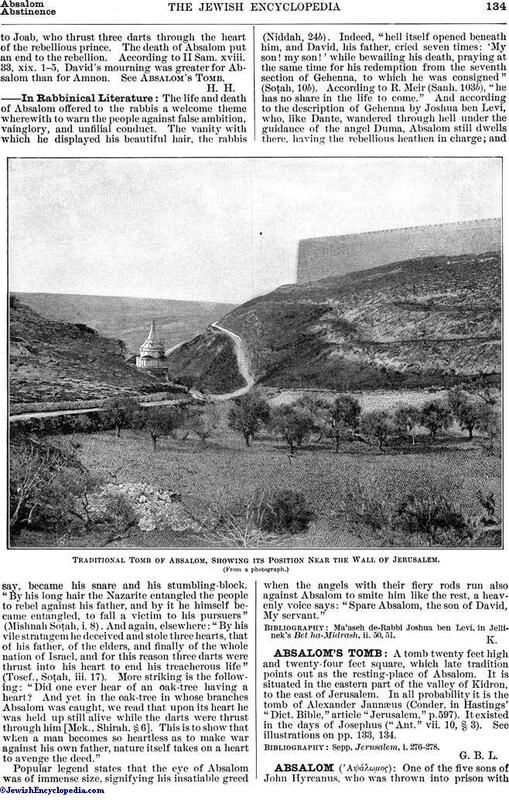 Traditional Tomb of Absalom, Showing its Position Near the Wall of Jerusalem. Ma'aseh de-Rabbi Joshua ben Levi, in Jellinek's Bet ha-Midrash, ii. 50, 51.